2014 was a year that I discovered new things to love and the publishing company Bookouture is definitely on that list. Book after book from them were on my must read recommendation list and Of Marriageable Age was no exception. I have long been a fan of books set in India and this book exceeded my expectations as it spanned several decades and continents with a rich tapestry of experiences and emotions that wove together to create this tale. 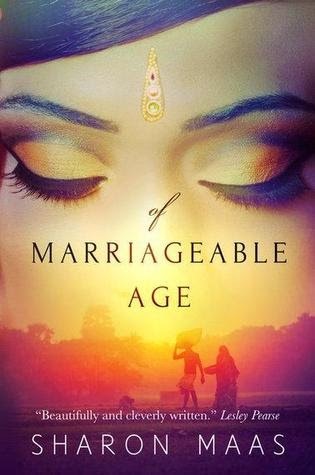 Of Marriageable Age was extremely well thought out and I could not anticipate where it would take me and I definitely did not expect how everything became connected. This, to me, was a true indication of the real talent of Sharon Maas as all too often, I find that stories are somewhat predictable or even at times unbelievable. This never happened once while I was reading her book. Everything made sense yet not in a way that I could have expected. I immediately felt compelled to continue reading as quickly as I could while still savoring every word of this intensely beautifully written book. Each character made you feel for them in their own way but also made you long to know more. Having not grown up in that culture, each precious detail that was provided had its place and helped to understand the story and all the implications. I cannot imagine having such talent to write such a wonderful story and I can only hope and pray that it is not too long before we are blessed with another of Maas's incredible books.